Where Does the World’s E-Waste Go? How much do we really know of the posing threat of Electronic Waste? How far should we push the continuous production of gadgets or technology items? What happens when we throw away our obsolete electronics? And How much are we contributing to Electronic Pollution. Reality shows how we buy more and more electronic and produce waste from time to time, it’s not surprising that many infographics may show details of each item within a targeted household, school, business institutions and/or individuals contributing to the increase of E-waste. What should we do to lessen our very own waste. Countermeasure against e-waste, which in recent years has become avery major concern. Discarded electronics present more than just plastic and silicon waste (even though Thosetwo are already hefty enough) being that both are notoriously hard to recycle. They also have Environmentallyharmful chemicals like, cadmium, and beryllium leaking from these devices’. These chemicals have servedto further worsen an already grimsituation by increasing the danger manifold. 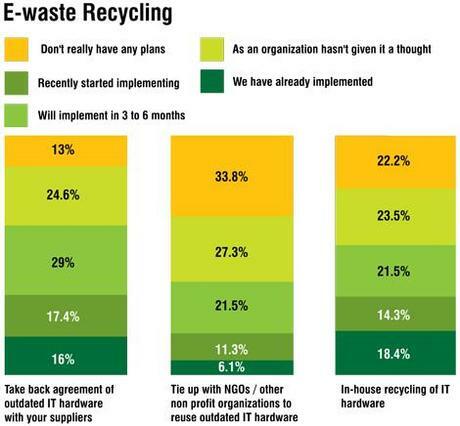 There are many countries around the world that are already aware of the threat of E-Waste to the Environment and only a few countrieshave gone making efforts on making their country Green as per example, In India (Above Image) shows three groups divided and rated on how they engaged onmaking India Greenor their efforts on E-Waste Recycling. This is one area or country that has been a target for dumping E-wastes and yet they were able to alleviate the threat of E-Waste in their Territory. But there are also other Countries were big amounts of E-waste are dumped and it may grow dramatically and scatter even more to other nearing countries. Since the rate of technology advancement has increased, the time frame for technology turnovers keeps Becoming smaller and smaller. As a result, more and more people are developing the habit of discarding Their “outdated” (a relative term, to be sure) gadgets as soon as newer models arrive on the market. This, of course, produces the obvious consequence of having landfills filled to the brim with discardedelectronics, which actually pose more of an environmental threat than most people may be aware of. These acts of wanton gadget replacement are certainly wasteful, although on the whole it isn’t necessarily an immediate threat; that is, as long as measures are taken to control the generated electronics waste (or E-waste). Other than outright abstaining from rampant impulsive gadget purchases for as long as one can hold out, anobvious and common solution to this problem is to sell used electronics or give them away. While this is a rather satisfactory (albeit temporary, in the grand scheme of things) solution, most people just aren’t very keen on owning second-hand gadgets direct from the source (i.e. the previous owner) since doing so may post the problem of possible undetected device defects which in most cases only become apparentafter the new owner has spent some considerable amount of time with the gadget.